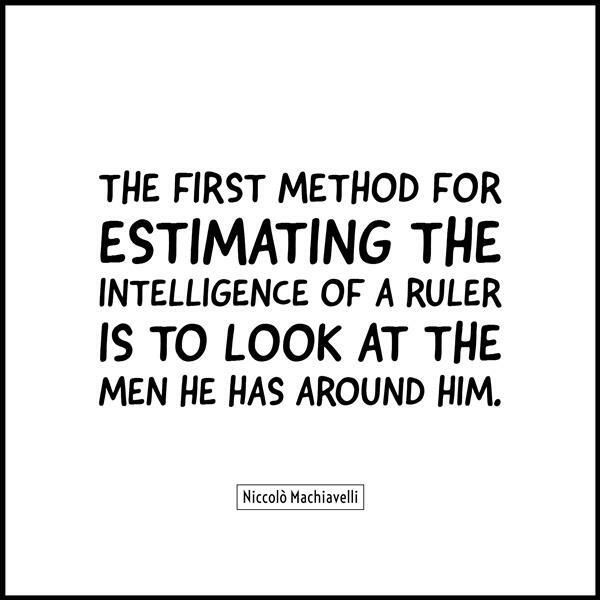 Machiavelli lived in the 15th century, but his methodology for determining the intelligence of a ruler is still valid today. Looking at the sycophants and henchmen around the #BLOTUS tells us a lot, not only concerning his intelligence, but his vision for our country. The most frightening fact is that this incompetent whiner has intentionally surrounded himself with those whose vision for destroying democracy perfectly coincides with his. From Jeff Sessions to Betsy DeVos, his Cabinet is filled with those antagonistic to the very departments they supposedly lead. The only picks that actually support the work of their department are those of the Department of Defense and other military postings. But then, this makes sense as all dictators want the strongest military they can afford. That’s what keeps them in power. #BLOTUS cannot compromise. He cannot negotiate. He cannot get legislation passed. Actually, he would be happy to rule by divine decree. The question I have, and that is rightfully being raised by many others, is where will the fascination and admiration that #BLOTUS has of the world’s worst dictators lead us? His desire to be a brutal strongman is obvious. Is his vision for the US to transform our democracy into a Trumptatorship? The very real and very frightening reality here is that this is our circus, and these are all our monkeys. This entry was posted in News & Views, Quotes and tagged Betsy DeVos, BLOTUS, circus, Department of Defense, dictators, estimation, henchmen, incompetence, intelligence, Jeff Sessions, legislation, monkeys, Niccolo Machiavelli, President, ruler, staff, strongmen, sycophants, Trumptatorship, vision, whining on May 3, 2017 by Ray Buchanan.